You thought it’d be okay to stop reading the King James Bible after page 1,116? In a shocking revelation, science has uncovered a cure for diabetes Christians have known about for centuries. Thanks to a commandment on page 1,117 in the King James Bible, thousands of Americans are naturally healing themselves without drugs, injections, or even supplements. At least scientists figured out this miracle diabetes cure. 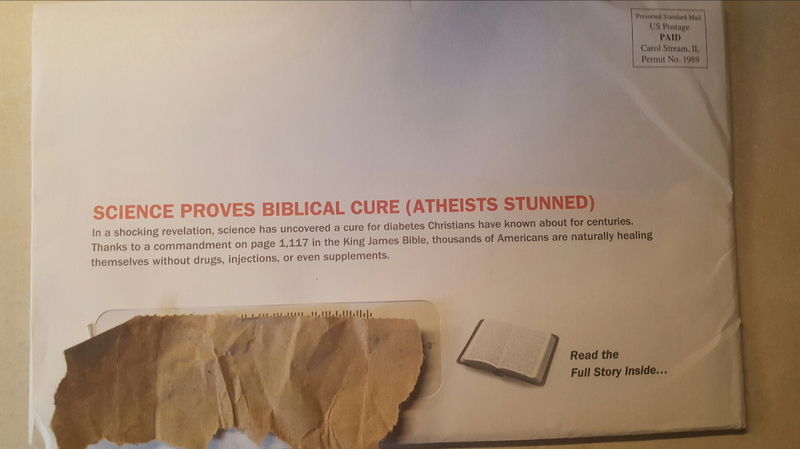 Guess they didn’t need the Bible after all… And does this mean Christians with diabetes aren’t using drugs, injections, or supplements? Where’s the Silver Ring Thing program for that one? I love how that message suggests that every version of the KJV Bible has the same material on every page, as if Jesus Himself dictated the font and page sizes in every book.